Nokia 3, Nokia 5 and Nokia 6 Android smartphone users will get additional 3G/4G data with Vodafone. India's second largest telecom service provider has announced that additional data will also be available to to existing postpaid subscribers. Vodafone, India's second largest telecom service provider is now offering special data plans with HMD Global's Nokia-branded smartphones. 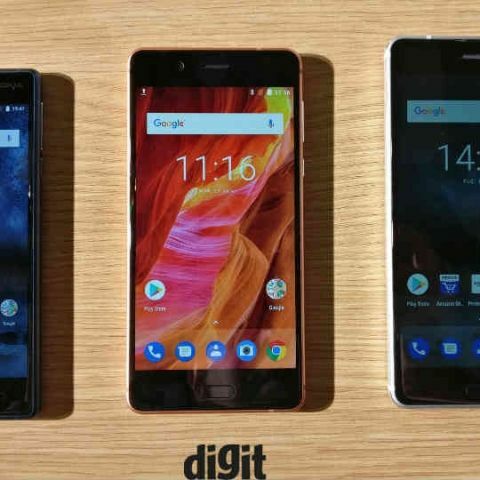 The telecom service provider has partnered HMD Global to offer additional 3G or 4G data with the purchase of Nokia 3, Nokia 5 or Nokia 6 smartphones. Vodafone also announced a similar partnership with OnePlus to offer 45GB data for 5 months to OnePlus 5 buyers. Vodafone is offering 10GB data at Rs 251 per month for 3 months on the purchase of Nokia 6. With the purchase of Nokia 5 and Nokia 3, the telecom service provider is offering 5GB data at Rs 142 per month for 3 months. Vodafone's postpaid subscribers can avail a total of 5GB or 10GB data per month for 3 consecutive billing cycle if they have a minimum 1GB data pack active on their monthly rental plan. "We are delighted to partner with HMD Global to roll out this exciting offer that enables our customers to get the most out of their new Nokia smartphones. Customers can use the higher quantum of data on Vodafone SuperNet, our Data Strong Network to access the internet, make video calls, upload albums and even download heavy files wherever they are. These offers will further enable our customers to remain confidently connected and enjoy a worry free Vodafone SuperNetTM4G experience on our best network ever," said Sandeep Kataria, Chief Commercial Officer, Vodafone India. "This partnership showcases our commitment to provide the best possible experience to our Nokia smartphone consumers who are Vodafone subscribers. Our commitment to providing our customers with a rich, engaging and immersive experience extends across our smartphone range and will come to life when combined with Vodafone’s seamless data connectivity across the country," Ajey Mehta, Vice President India, HMD Global said in a statement. HMD Global announced Nokia 3, Nokia 5 and Nokia 5 for the Indian market a few weeks back. Nokia 3, the cheapest of the three smartphones, is now available via offline retail channels. The Nokia 5 is expected to reach retail stores next month, while the Nokia 6 will become available online from Amazon India starting July 14. The Nokia 3 is priced at Rs 9,499 while Nokia 5 is priced at Rs 12,899. Nokia 6, the premium mid-range smartphone is priced at Rs 14,999. After the launch of Reliance Jio's 4G service in September last year, Vodafone started offering additional 3G/4G data to all its existing subscribers. The company announced additional 9GB 4G data at 3GB per month for three months for some of its subscribers. Vodafone says this additional data with Nokia smartphones is valid across all circles, but customers in Andhra Pradesh, Telangana, Madhya Pradesh, Chhattisgarh, Bihar, Jharkhand, Himachal Pradesh and Jammu & Kashmir will only get 2G speeds.